After a scoring drought that, at times, seemed to date back to last season, the Penguins have scored 7 goals in two games (in a reversal of fortune, one even came on the power play), and it would be fair to say that the complete lack of offensive output from a Penguins team featuring Sidney Crosby, Evgeni Malkin, Phil Kessel, and Kris Letang was the biggest problem haunting the team. It seems simple, then, that after a rough start fans should be celebrating six wins in seven games and seven goals in two games. Somehow, though, this seems like cold comfort. Perhaps it is because over the past couple of years, the Penguins have cultivated a “win now” mentality within the organization that has translated to their fanbase. The Penguins have traded draft picks, emptied their prospect system, and locked up large portions of the salary cap in contracts awarded to their star players. Since their last Cup win in 2009, they’ve also seen success in the regular season, had home-ice advantage in the playoffs, and had players win the Art Ross and Hart trophies. But still, there is one question that looms over this team: Can they win it all? All things considered, if the Crosby-era core can’t get it done, then the Penguins don’t have an answer. What this “Stanley-Cup-or-bust” attitude has led to is a denial of the importance of the regular season. Individual trophies and accomplishments, division wins, and the elation of a midweek overtime win can all be brushed aside with a simple reminder of how early the Penguins have exited the playoffs in recent years. What do a wraparound goal by Malkin, or an impossible cross-ice pass by Crosby, matter when the Penguins couldn’t stop a beach ball against the Flyers? For me, as a fan, this style of watching the Penguins has become untenable. What if we thought of the regular season as meaningful? What if we gave more value to the games the team is playing from October to April, when you’re spending most nights of the week pouring energy into the team, instead of forsaking the bulk of the time and energy expended as a fan in favor of a few games, in a few weeks, at the end of the season? I’m not calling for a restructuring of the league, or suggesting anyone take the Presidents’ Trophy as the real Stanley Cup. I’m not even suggesting that the goal shouldn’t be to win the Cup. I’m suggesting that part of the fatigue of being a fan comes from watching games for seven months and telling yourself the whole time that they don’t matter. That nothing matters except the last 16 wins. Maybe you never forget the last 16 wins (or, in the case of the Penguins, the last four losses), but the last 16 wins never come into being without the 82 games of the regular season before them. 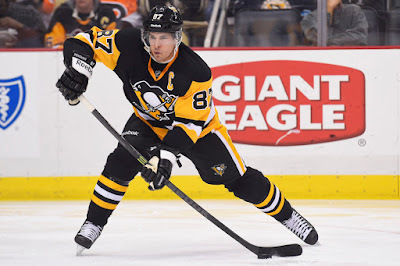 Sidney Crosby and Evgeni Malkin have spent the better part of a decade being the most prolific players in the league; few players have come close to the dominance exhibited by Crosby and Malkin in that timeframe. I’m not ready to suggest that their careers amounted to nothing if they don’t win another Stanley Cup together. Maybe these are the words of a fan staring down a team that just got above .500 for the first time this week and a close-to-barren prospect system. But I think there’s something else here, too. Because it’s not only the fans that have this win-now attitude. We, the fans, have learned this attitude from the team. The Penguins in their actions and their words have been selling that the time to win is now. The stakes are high in Pittsburgh, and reports abound that the organization is tense, sensitive. This tension arises from knowing that not even a Presidents’ Trophy-winning season could be enough if the team doesn’t achieve a deep playoff run. What is becoming clear is this shortsightedness is starting to cost them. In costs them not only in big, obvious ways, because trading picks for roster players means they haven’t been able to add depth to their prospect system, but it also costs them because the Penguins have lost respect for the process. If the culture of the organization is such that people fear for their jobs, and the only thing that matters is the Stanley Cup chase, then the organization would be wise to focus on games in December, January, and February. This is the kind of thought process that prevents trades like the Despres trade while also ensuring that the team is playing its best hockey heading into the playoffs. Because contrary to common belief about the expendability of the regular season, it’s the playoffs that won’t matter if the process during the regular season isn’t good. For the Penguins this season to date, the process hasn’t been very good. Pittsburgh is below league average in both shot generation and shot suppression. At even strength, the Penguins are bleeding shots against, with a corsi against per 60 (CA60) of 58.77 (in the league, only Philadelphia, Long Island, and Colorado are worse). Thursday night’s performance against the Sabres, in which the Penguins allowed 53 shots on goal, was their worst defensive performance since game 5 of the 2008 Stanley Cup Final*. Since 2007-2008, only one team that allowed more shot attempts against than average has won the Cup, and teams that succeed at shot suppression make the playoffs much more regularly than those that allow more shots than average. Forget succeeding in the playoffs--to even make the playoffs, the Penguins have to play good defense during the regular season, something the above stats tell us they’re failing at. There is no one deadline-day trade that can fix this for the Penguins. It’s not only Pittsburgh’s top defensive pairing, or their fourth line, that’s getting outshot. Most nights, it’s players in every pairing and on every line. But if the only calculation the team can do is enacting the short-sighted belief that it’s better to have a defenseman with experience on the blue line come playoff time, rather than appreciating that the regular season provides both important data about how the team is playing (and how it is likely to continue playing) and time to right what is wrong, then the Penguins are doomed to continue to repeat the mistakes of the last few years. But if the Penguins can learn to value the regular season, appreciating the process, then the good news is that they have 72 games left to figure it out. *Thanks to @thatandysmith for passing along the statistic (and for the encouragement).